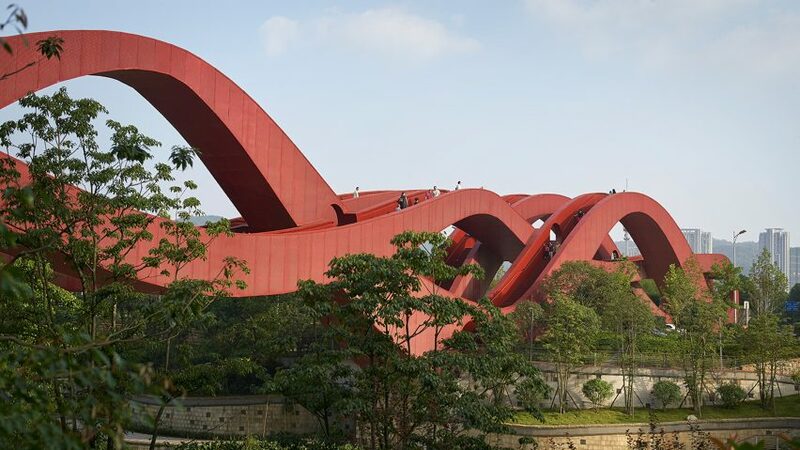 NEXT Architects has completed an undulating red footbridge in Changsha, China, that offers pedestrians a variety of different routes across the Dragon King Harbour River. Beijing and Amsterdam studio NEXT Architects designed the Lucky Knot bridge for Changsha's Meixi Lake district – a 6.5 million-square-metre development masterplanned by Kohn Pedersen Fox for the southwest of the city. At 185 metres long and 24 metres high, the red steel bridge rises and falls across its course to permit views of the river, Meixi Lake, the city and the surrounding mountain range. "The city is growing and changing rapidly. This context called for a unique gesture to inspire passers-by," said partner Michel Schreinemachers. The bridge's sequence of walkways connect river banks, the road and a park, all located at different heights. First unveiled by the firm in 2013, the sinuous form was inspired by the never-ending surface of a Möbius strip. "The shape of the Lucky Knot was inspired by the principle of the Möbius ring, as well as by the Chinese knotting art," added partner John van de Water. "In the ancient decorative Chinese folk art, the knot symbolises luck and prosperity." "The final shape of the bridge is the result of – literally and metaphorically – knotting all these routes together." The Lucky Knot is the latest in a series of bridges by NEXT Architects, following a bat-friendly bridge in the Netherlands and a sinuous hilltop staircase. "Combining the Dutch team's expertise in infrastructure and water management, and the Chinese team's perseverance and knowledge of the local context was a crucial part of the process," said the architects. "Now, just a few weeks after the opening, the bridge has already become an icon."